Siemens has further developed its SIMATIC PCS 7 process control system and released Version 8.2 to meet the rising demands of automation. This version comes with a range of new functionalities to improve user convenience as well as the performance and efficiency of the process control system over the entire life cycle of process plants – from the planning stage through to maintenance. Plant engineers will benefit from more efficient engineering solutions, while operators will experience greater convenience in daily operations due to greater system availability and lower overall running costs. To allow production processes to run with the greatest possible stability and efficiency, Version 8.2 of SIMATIC PCS 7 offers individual, networked and reliable plant monitoring. Web systems can now also be operated and observed over the Intranet/Internet. For this, operators can use extensive configuration possibilities for individual and secured online access to the operating and monitoring level of a production plant, enabling the implementation of benefits such as remote control room concepts. The integration of mobile terminals in SIMATIC PCS 7 has also been extended. This allows information such as production characteristics, trend or alarm functions to be viewed at any time from any location using smartphones or tablets – no matter which operating system is used. SIMATIC PDM (Process Device Manager) supports plant-wide access to field devices. Diagnosis, maintenance, parameterisation, configuration and commissioning can now be performed from mobile terminals with standard browsers or from any optional computer within a system. By enabling the parameterisation of field devices, the PDM solutions help improve servicing productivity. The new version of SIMATIC PCS 7 supports operators with a new range of search and visualisation functions. One of these is the measuring-point-browser, which accelerates the selective search for measuring points with relevant plant information. The Operator Trend View tool depicts the process sequence in the form of trend graphs for a rapid overview, helping the operator achieve optimised plant monitoring and process control. The group view visualises existing measuring points, making operation faster and more intuitive for plant personnel. The new Logic Matrix plays a key role in ensuring efficient plant engineering. It allows the efficient switching of interlock statuses in a production plant in compliance with the cause and effect principle. The Logic Matrix can be efficiently processed, exported or imported with Microsoft Excel. Furthermore, in SIMATIC PCS 7 version 8.2, mass data engineering has also been substantially extended: for instance, technological engineering with function, system and layout plans and the relevant documents for SIMATIC PCS 7 projects. This substantially reduces the work entailed in compiling PCS 7 documentation. To avoid load peaks in the power supply, the new version of PCS 7 also offers integrated monitoring of all energy-relevant consumption data for a complete plant. The load management functions to control loads such as drives are a constituent part of the technology library and can be simply implemented. This supports plant operation within contractually-agreed energy supply conditions and enables the selective optimisation of power consumption. 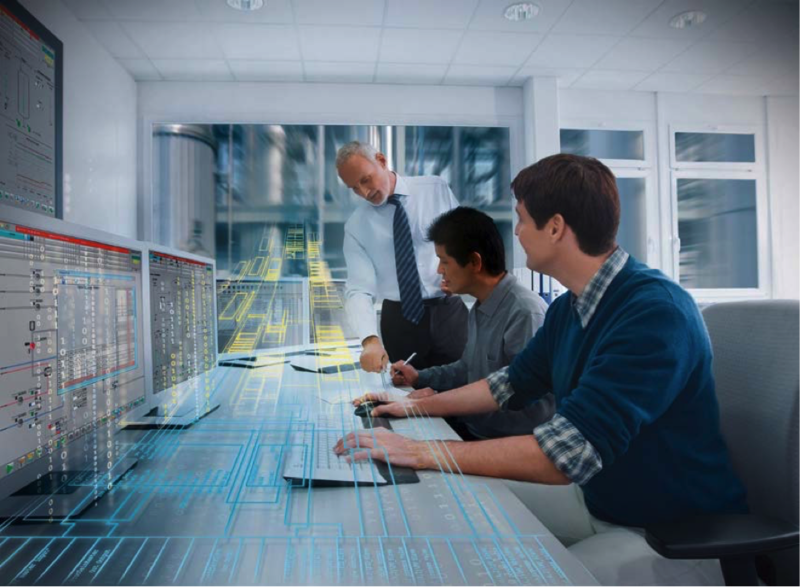 To ensure that the process control system stays abreast of the latest technological developments at all times, Siemens offers a Software Update Service (SUS) for SIMATIC PCS 7. This also encompasses support for new operating systems such as Microsoft Windows 10 and Server 2012 for PCS 7 V8.2. Intelligent robots: should we be scared?